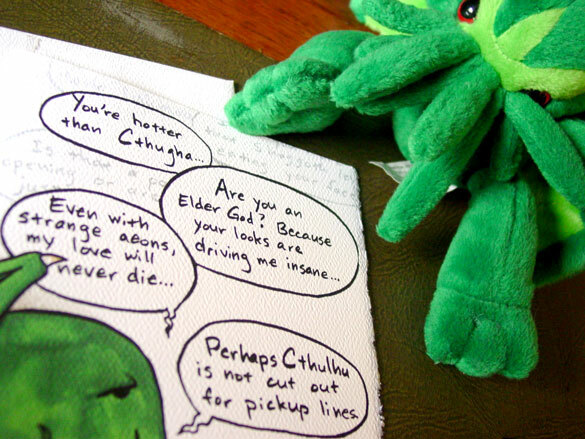 Cthulhu Pickup Lines, 5″x7″ pen & ink and Copic marker. 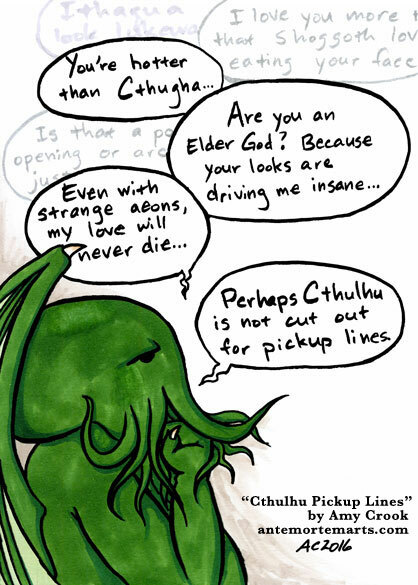 Perhaps Cthulhu is not cut out for pickup lines. 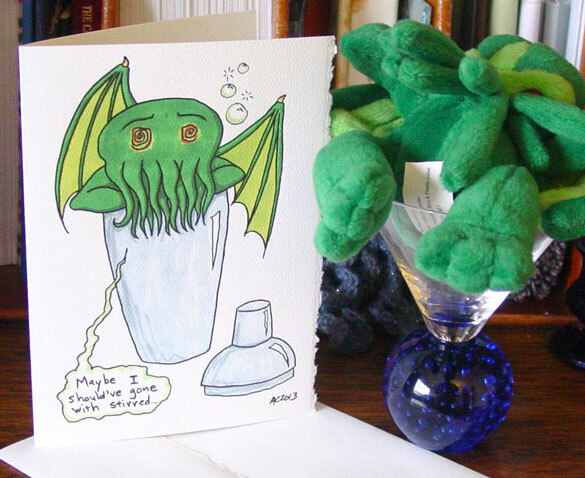 Buy the Valentine in my Etsy shop, and show someone you love them in the cheesiest, most tentacular way possible. 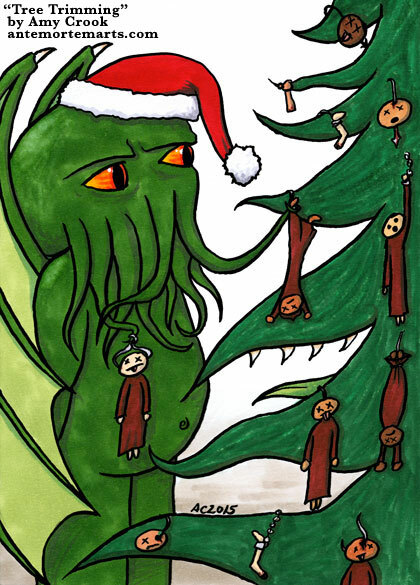 Cthulhu is getting into the holiday spirit a little early this year! 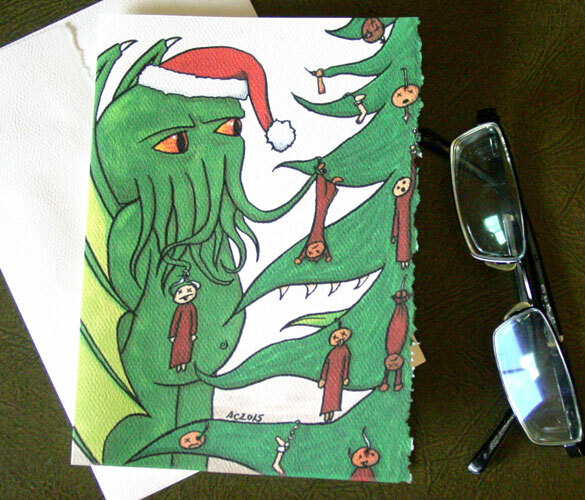 He’s trimming his tree with his favorite decoration, cultists. Even the tree is enjoying its little holiday snack, er, decor. 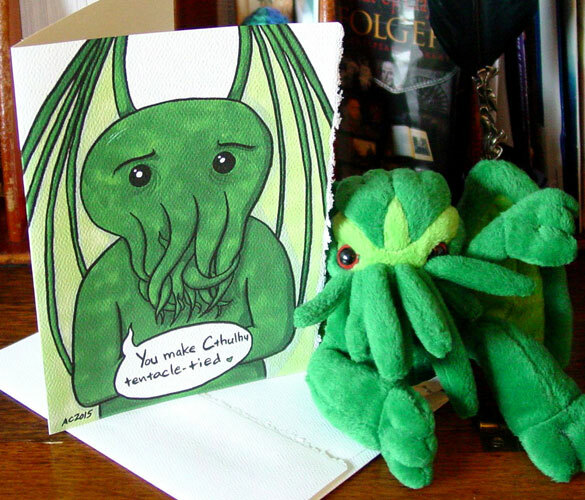 The greeting card will bring just the right holiday cheer to the right person — a fan of horror, especially the Lovecraftian sort, with a good sense of humor. Tree Trimming, 5″x7″ pen & ink and Copic marker on paper. “You make Cthulhu tentacle-tied,” says the Elder God of legend and nightmare, looking quite wide-eyed and nervous. 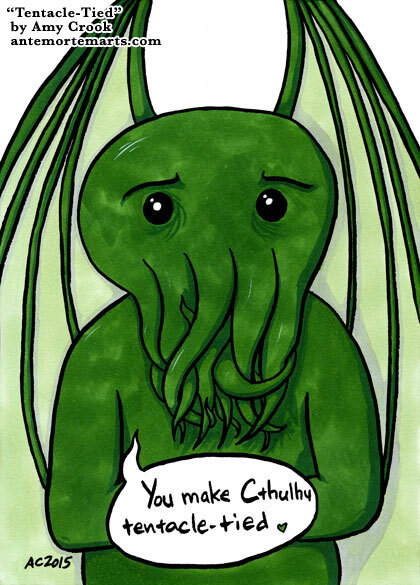 Will you take pity on Cthulhu and be his Valentine? Tentacle-Tied, 5″x7″ pen & ink and Copic marker on paper. Three colors of pen, three different inking techniques, and one creepy drawing. Cthulhu glares balefully out of his cave, surrounded by strange growths and bathed in darkness. He waits for the stars to be right, for the summoning that will bring him from his sleep of death and up into the world once again. 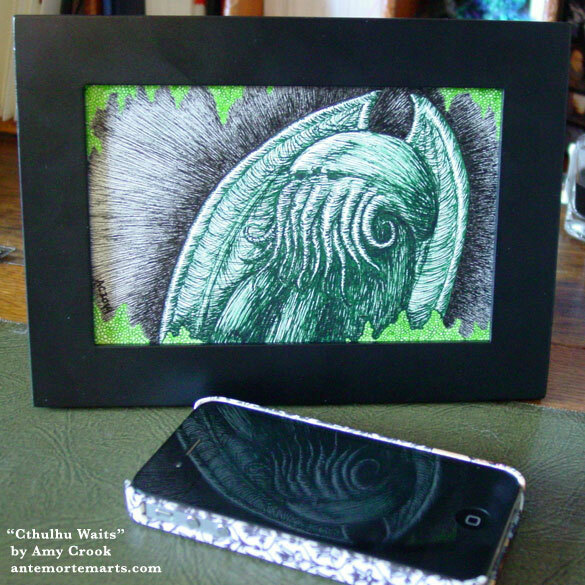 Cthulhu Waits, 6″x4″ pen & ink on Fluid watercolor paper. 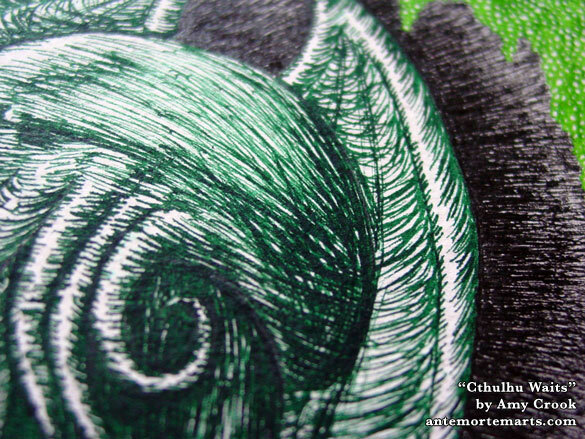 Above, you can see all three inking techniques up close, the roe-like stalactites hanging down above the fine-inked blackness, with Cthulhu in his scribbly, tentacled glory. Below, you can see the piece in a frame, just waiting to drive you mad with its strange details. 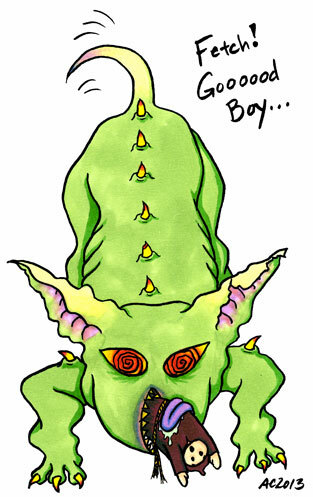 The Hound of Tindalos is one of the most evil, annoying monsters to draw while playing Arkham Horror, and so of course I wanted to draw one being adorable. He’s playing fetch the cultist with Cthulhu! I’m sure the one he’s brought is only slightly chewed. There’s not actually any real description of the hound in the books, it’s only called that because once it gets a time traveler’s scent, it will follow him through space and time like a hunting hound. 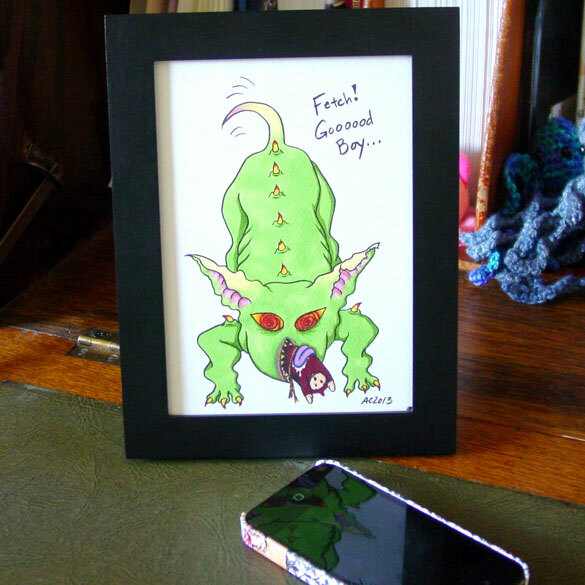 Fetch the Cultist, 5″x7″ pen & ink and Copic marker on paper. 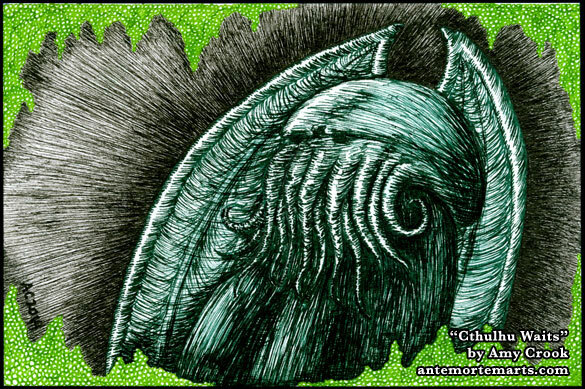 You can get him in black & white in my Cthulhu Holiday Fun Book, or pick up the original during May’s Floating Gallery. 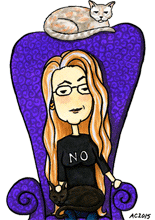 Join my Art Patron’s list for a chance to see (and buy) each month’s new art before the rest of the world. When I was working on illustrations for my Cthulhu Holiday Fun Book, I wanted something for New Years that was like a pinup, only with Cthulhu. I actually googled up some cocktail pinups, and while I found a few delightful girls in martini and Champagne glasses, it was the one perky pinup in a shaker that caught my eye. 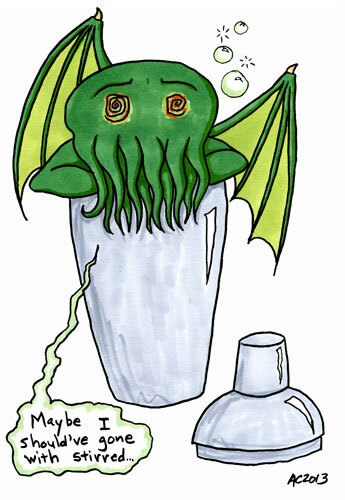 Alas, Cthulhu didn’t realize that he’d be the one shaken, and I think he got a little more than he bargained for. Shaken Not Stirred, 5″x7″ pen & ink and Copic marker on paper.